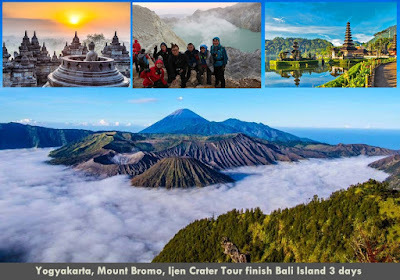 Yogyakarta, Mount Bromo, Ijen Crater Tour finish Bali Island 3 days is one of the trip option for Mount Bromo tour finish Bali starting from Yogyakarta and drop off at Bali Island after Ijen Crater trekking. This trip itinerary normally requested by Our clients who have finish enjoy interested place around the Yogyakarta City like Borobudur Sunrise, and Prambanan Temple. 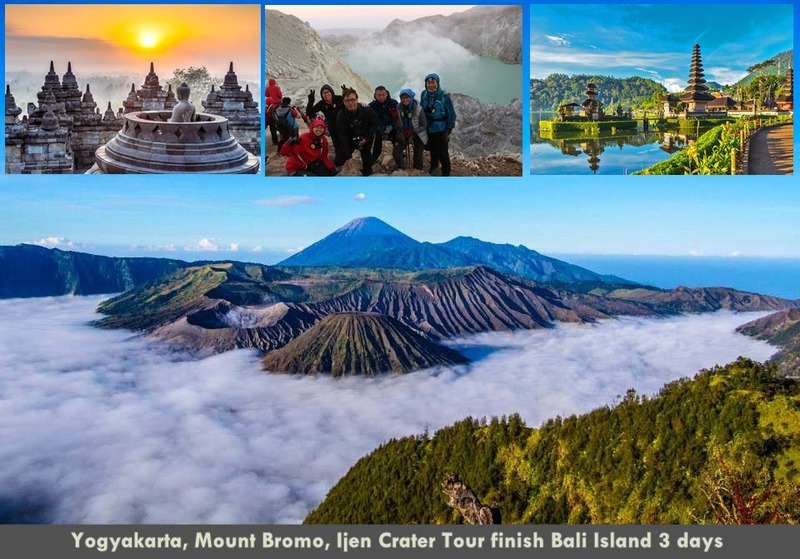 Beside the travel from Yogyakarta, You also possible book 3 days 2 night Mount Bromo, Ijen Crater tour from Surabaya or Malang. So, You can begin your trip from Surabaya in the daytime and finish in the afternoon. Get your hotel around Cemoro Lawang, Stay 1 night. If you the weather is good and Clear, You can take photo fo Mount Bromo Milky Way from your hotel. From Pananjakan peak, taking a picture for sunrise views, see the sunrise with its young volcanic include the landscape of Crater, Sea of Sand, Mt Batok, and an active Semeru volcano summit. After enjoying the sunrise at 06.30 AM, Return to your jeep, continue to the Crater rim for 20 minutes, Stop at Sea of Sand (jeep parking). Afterward, start Mount Bromo trekking wherein You will walk around 30 minutes toward volcano rim or using pony ride for 15 minutes. Enjoy the beauty of Crater at 09.00 AM, After that, back to your hotel through the same route. Reach your hotel, have breakfast, take shower, relax and prepare to check out. After check Out from hotel near Cemoro Lawang, Our driver will accompany your trip head toward the Hotel around Ijen Crater Banyuwangi along 5 - 6 hours. Check in to stay 1 night. Reach the Ijen volcano rim, Enjoy the stunning natural scenery consist of a green acid lake, fresh air & shady while seeing the local miners' activity loading sulfur from the bottom of Ijen volcano. From Gilimanuk Port, drive to your hotel around Bali Island like Kuta, Sanur, Ubud and other location as your request. Get your Hotel around Bali Island, Finish Yogyakarta, Bromo, Ijen Crater Tour package 3 days. Yogyakarta, Mt Bromo Sunrise, Ijen Crater tour 3 days Bali provided for Our clients who need to start this their trip from Yogyakarta because some tourist normally still spend their time to see Borobudur Sunrise, Prambanan and other places around Yogyakarta before beginning Mount Bromo, Ijen volcano tour 3 days. For more information about Mount Bromo tour package price finish Bali and facility, You can visit Our contact.